Continuing our celebration of the oddly named Malbec World Day we’re going to get geeky here at Spitbucket about the Malbec grape. In Jancis Robinson’s Wine Grapes, the entry for Malbec is under Cot (or Côt) because of the association with grape’s likely birthplace in the region of Cahors in the historical province of Quercy in southwest France. Ampelographers note that like Côt many of the other early names for the grape such as Cos, Cau, Cor and Cors all seem to be contractions of Cahors. 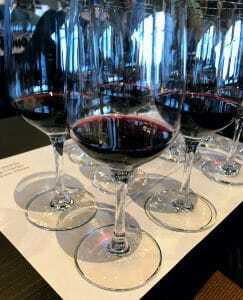 However, the first written account of Malbec was in Pomerol in 1761 as Noir de Pressac (black of Pressac). The name likely referred to the individual who first cultivated the vine. From Pomerol, the grape made its way to the Left Bank region of the Medoc. Here it took on the new name of Èstranger (stranger) or Estrangey. The name Malbec came from a grower named Malbeck who propagated the grape in what is now known as Sainte-Eulalie in the Premières Côtes de Bordeaux AOC of the Entre-Deux-Mers region. In 2009, DNA analysis discovered that Magdeleine Noire des Charentes–the mother grape of Merlot (Check out the Academic Wino’s Who’s Your Daddy? 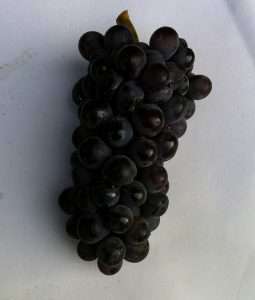 series on Merlot)– and an obscure grape from the Tarn department called Prunelard were the parent varieties of Malbec. 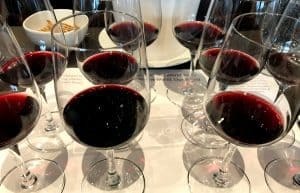 In addition to being a half-sibling of Merlot, Malbec has done a bit of its own “cross-pollinating” being a parent grape to Jurançon noir (with Folle blanche) and Caladoc (with Grenache). Malbec used to be far more prevalent in the Bordeaux region. In fact, Stephen Brook noted in The Complete Bordeaux that it was the most widely planted grape in the vineyards of Lafite in the 18th century. Many estates classified in 1855 had Malbec account for as much as 50% of their blends in the early 19th century. However, the latter half of the 19th century would usher in the decline of the variety due to its sensitivity to coulure and mildew. Following the devastation of phylloxera, many growers who did replant chose to replace Malbec. 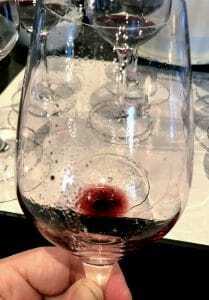 The easier to grow Cabernet Sauvignon and Merlot were favored choices. Into the 20th century, Malbec was still present, particularly in the Right Bank. However, the devastating frost of 1956 killed off a significant number of plantings. This practically signaled the death knell for the grape in Bordeaux. There are still some small plantings in Bordeaux. The most significant strongholds are the Côtes de Bourg and Côtes de Blaye. In St. Emilion, Cheval Blanc and Jean Faure are two notable estates with some plantings of Malbec. In Pomerol, Chateau L’Enclos (owned by the Adams family who also owns Chateau Fonplegade in St. Emilion) also maintain some Malbec. On the Left Bank, a 1 ha block of old-vine Malbec is still producing for Ch. Gruaud Larose in St. Julien. Fellow 2nd Growth, Ch. Brane Cantenac in Margaux grows a few parcels of Malbec (as well as Carmenère). In the Graves region of Pessac-Leognan, Ch. Haut Bailly owns a 4 ha block of 100+-year-old vines that includes a field blend of all six Bordeaux varieties–including Malbec and Carmenère. Malbec vines growing in Argentina. Michel Pouget introduced Malbec to Argentina, bringing pre-phylloxera cuttings of the grape from Bordeaux to the country in the 1850s. Compared to their French counterparts, clusters of Malbec in Argentina are smaller with tighter berries. These smaller grape berries have a skin-to-juice ratio that produces deeply colored wines with intense black fruit. The Bordeaux influence in Argentina is still felt today with producers like like Léoville Poyferré (Cuvelier de Los Andes), Michel Rolland (Clos de los Siete), Cheval Blanc (Cheval des Andes), Hélène Garcin-Lévêque (Poesia) and Lafite-Rothschild (CARO) having projects in Argentina making both varietal Malbec and using it in Bordeaux style blends. The grape is widely planted throughout the US including in states like Missouri, Idaho, Georgia, Arizona, Virginia, North Carolina, New York, Maryland, Texas and Michigan. 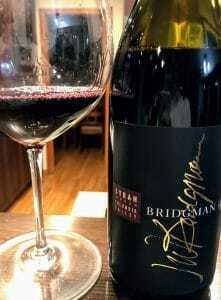 Here it is made as both as a varietal wine and as a blending component. 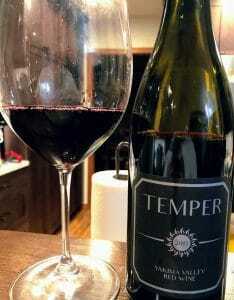 In Napa Valley, despite being a regular feature of popular blends like Opus One and Joseph Phelps Insignia, Malbec is sometimes considered the “Gummo Marx” of the Bordeaux varieties. Part of the grape’s low standing in the region was historically due to poor clonal selection. However, as better clones from Cahors and Argentina become available, growers in Mt. Veeder, Coombsville and Atlas Peak are increasing plantings. Outside of Napa, Malbec is widely planted in the San Joaquin Valley where it is used for mass-produced bulk blends. However, there are quality minded producers making varietal Malbec wines throughout the state. Key areas include Paso Robles, Dry Creek Valley, Santa Ynez, Lodi and the Sierra Foothills. Red Willow Vineyard in Washington State. In Washington State, Malbec has the distinction of being the most expensive grape per ton. The average price for a ton of Malbec in 2016 was $1,587. In contrast, Cabernet Sauvignon was $1,442/ton, Merlot $1,174/ton, Chardonnay $940/ton and Semilion (the most expensive white grape) at $1,054 ton. 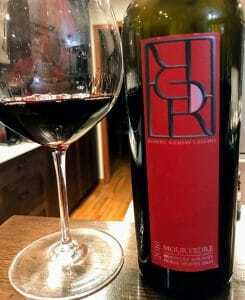 While Red Willow Vineyard in the Yakima Valley helped pioneer the grape in Washington State, Paul Gregutt in Washington Wines and Wineries: The Essential Guide notes that Casey McClellan of Seven Hills Winery was the first to plant the grape in Walla Walla in the early 1990s. Check out the hashtags #MalbecWorldDay and #WorldMalbecDay on Twitter and the Malbec tag on Instagram for more fun. Tagged 1956 frost, Argentine wine, Atlas Peak, Brane Cantenac, Cabernet Sauvignon, Cahors, Caladoc, California wine, Carménère, CARO, Casey McClellan, Ch. Fonplegade, Ch. Gruaud-Larose, Chardonnay, Chateau Haut Bailly, Chateau L’Enclos, Cheval Blanc, Cheval des Andes, Clos de los Siete, Coombsville, Côtes de Blaye, Côtes de Bourg, Cuvelier de Los Andes, Dry Creek Valley, Folle blanche, Grenache, Hélène Garcin-Lévêque, Jancis Robinson, Jean Faure, Joseph Phelps Insignia, Jurançon noir, Lafite Rothschild, Leoville Poyferre, Lodi, Magdeleine Noire des Charentes, Malbec, Malbec World Day, Margaux, Medoc, Merlot, Michel Pouget, Michel Rolland, Mt. 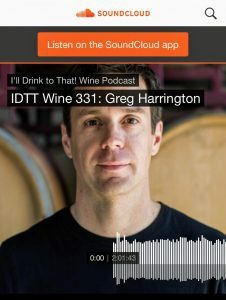 Veeder, Opus One, Paso Robles, Paul Gregutt, Pessac-Léognan, phylloxera, Poesia, Pomerol, Premières Côtes de Bordeaux, Prunelard, Red Willow Vineyard, San Joaquin Valley, Santa Ynez, Semilion, Seven Hills Winery, Sierra Foothills, St. Emilion, St. Julien, Stephen Brook, The Academic Wino, The Complete Bordeaux, Walla Walla, Washington Wines and Wineries, Wine Grapes, Yakima Valley. 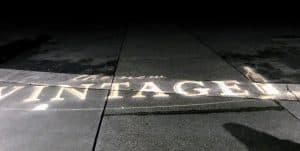 After many years of only attending the Grand Tasting of Taste Washington, I decided to participate in some of the other events going on during Taste Washington weekend–the seminars and The New Vintage party. While the Washington vs The World seminar was awesome, the New Vintage party was….less than stellar. Is it a party, a tasting or a cattle call? In reality, it was an event to bump and be bumped into by other people as you try to make your way through the sea of humanity to a table to get a sample of wine or food. 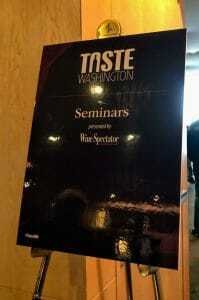 In many ways, it felt like a more scaled down version of the Taste Washington Grand Tasting. But instead of having the spacious CenturyLink event center, you had this large crowd of folks squeezed into a smaller event space at Fisher Pavilion. 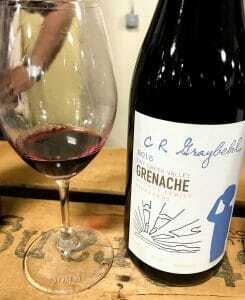 Most of the strategies I talked about for dealing with the crowds at the Grand Tasting didn’t apply to The New Vintage because of how difficult it was to move around. 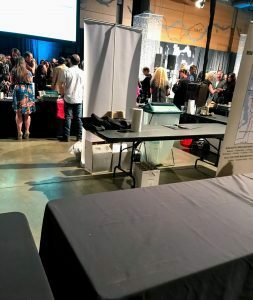 Even if there was an empty table somewhere (which, with about a 1/5th of the wineries and restaurants compared to the Grand Tasting, wasn’t likely) you still had to literally fight, slip, slide, sneak, ope, excuse me, pardon, sorry your way to that table. To give you a feel of the environment, this was a 30 second video I took about an hour into the event trying to move past the music stage and get to the Rosé Lounge. 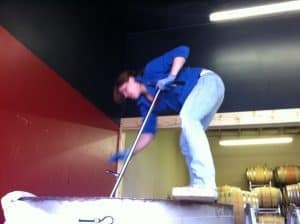 Note that my short 5’3 self is juggling my phone, wine glass and event brochure while trying to film this. 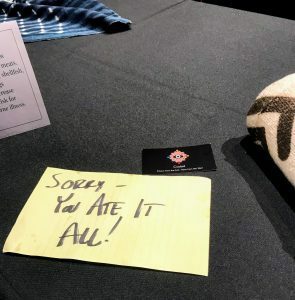 Good luck trying to “chat” with celebrity chefs as they were busy working their tails off to keep a steady stream of food going for the crowds. Ditto with winemakers but that is usually par for the course with these types of tastings as people always want to monopolize winemakers’ time. Truthfully, the only people that were easy to talk to were the lonely guys at Voya Financial who were somewhat conveniently located by the stage. Before the music started, that was the only table in the event that didn’t have a mass of people in front of it. 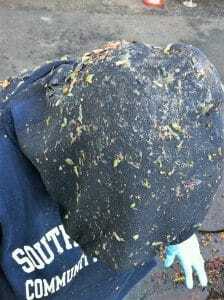 This picture was taken just after the video where I had a clearing to raise my arms up and capture a better crowd shot. The Rosé Lounge I was working towards is ahead in the corner. And dancing? Ha! Maybe we could’ve gotten some mosh-pit action going on at best–though really the music provided by the synth pop duo Man Made Time wasn’t of the “moshing” vibe. Plus, where were you going to put your wine glasses while dancing? Just like at the Grand Tasting, there was good wine and good food to be discovered at The New Vintage. Below I list some of my favorite wines but among the food, I was blown away by the pork rillettes made by Brooke Williamson of the Hudson House on Redondo Beach. 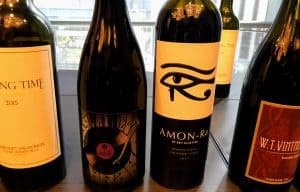 Compared to the Grand Tasting of Taste Washington which focuses on local restaurants, I appreciated that The New Vintage gave us a chance to try something new from this LA area chef. The music was actually great. I never heard of Man Made Time before but their singer, Hillary Grace, has a gorgeous voice. I also loved the concept of a “Rosé Lounge” (though, in reality, it was actually more of just a Rosé Table with only sparse seating nearby). I fought my way through the crowds several times to use that table as a palate cleanser and ended up finding several of my favorite wines of the evening. 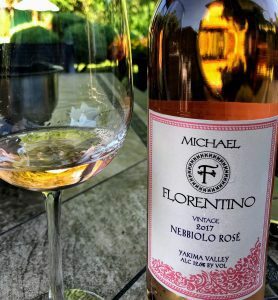 With Taste Washington weekend usually happening close to the beginning of Spring, having a prominent Rosé featuring event is a great idea and one that I would love to see expanded. 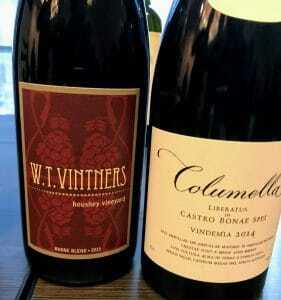 Even with the frustration and cattle call atmosphere, I still had a chance to discover some great wines. Here were are my 5 favorites. Fantastic bubbles! And unlike the guy who was working the Domaine Ste Michelle booth, yelling for people to try his “champagne”, the folks at Karma where very professional and knowledgeable about their product. 1.) 2013 Karma Brut sparkling wine — Everytime I taste Karma’s bubbles, I become more and more impressed. They have long passed Argyle as the Northwest’s best sparkling wine producer and are giving Schramsberg in California a run for their money as the best in the United States. A blend of 49% Chardonnay, 48% Pinot noir and 3% Pinot Meunier, this vintage sparker spent 48 months aging on its lees, creating beautiful depth of toasted spice pear with a creamy, silky mousse. Truly a gem out in Lake Chelan. 2.) 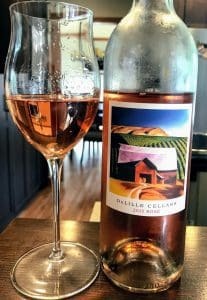 2017 WIT Cellars Rosé — A blend of Tempranillo and Sangiovese that I believe was made in a saignée style. 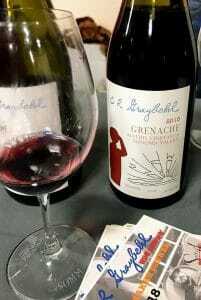 Lots of red wine character with strawberry and raspberry but bone dry with a long minerally finish. Impeccably made and well worth hunting for. 3.) 2017 Amelia Wynn Albarino — Beautiful high intensity aromatics of citrus and tropical fruit that I could smell as soon as it was poured into the glass. 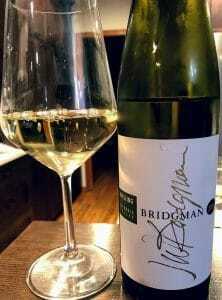 Very full-bodied for a white but with ample acidity and crispness. They also featured a Tempranillo rosé at the Rosé Lounge that was going toe to toe with WIT Cellars for the rosé of the night. 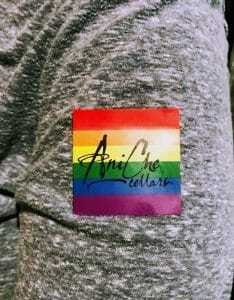 I also dug the schwag stickers from AniChe. 4.) 2017 AniChe Cellars Bombadil — a white Rhone blend of Grenache blanc, Picpoul and Viognier sourced from the Boushey vineyard in the Yakima Valley. 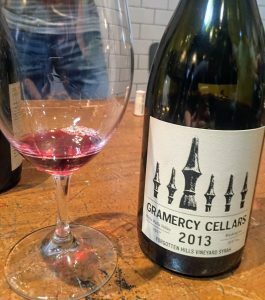 Anyone who read my review of Gramercy’s Picpoul could probably guess how excited I was to hear about this blend–and sure enough it delivered. A lot more weighty than a varietal Picpoul with the dominant Grenache blanc and Viognier, this wine had a silky mouthfeel of apples and lemon custard. Great summertime white to pair with heartier cuisine. 5.) 2014 Gard Vaucluse — A very savory Rhone blend of 68% Syrah, 29% Grenache and 3% Viognier that had a mix of juicy blue fruit, floral and spice notes. This table was on the opposite corner of the Rosé Lounge and after tasting this huge wine I wanted to give my palate a break with some rosé. 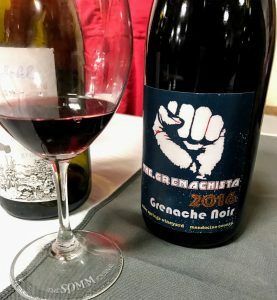 It took me over 10 minutes to navigate through the crowds to get to the other side of the room and I was still tasting this wine. 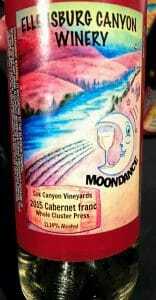 Honorable mention for the most geeky wine I tried at the event–2015 Ellensburg Canyon Winery White Cabernet Franc — Yes! A white Cab Franc! 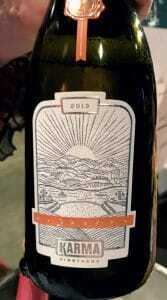 Sourced from Cox Canyon Vineyards, the grapes were whole cluster pressed right after harvest to produce this white wine. While it didn’t have all the evocative aromatics of red Washington Cabernet Francs that I adore so much, it was still a tasty white wine that I applaud Ellensburg Canyon Winery for trying their hand with. It reminded me of a more weighty and textured Italian Pinot grigio. 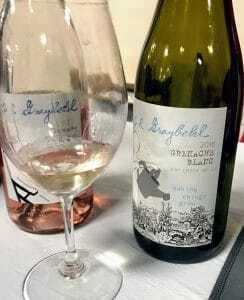 Another honorable mention to Ducleaux Cellars who featured several wines that impressed me–their One Night Stand rosé, Jordyn white Rhone blend and Anarchy red. The only reason they didn’t make my top 5 is because I honestly couldn’t figure out which of the three that I liked the best. Ducleaux, AniChe, WIT Cellars and Amelia Wynn were first time tastes for me and all four are wineries that I’m eagerly looking forward to discovering more about. One of the empty winery tables that had already packed up and left by 9:17pm — with more than 40 minutes left in the event. But also look at all that space in the center. A better layout would have minimized the “moshing” and cattle call feel of the event. The first thing the event organizers need to do is nail down exactly what they want this event to be and then tailor the event space to serve that purpose. If they want it to be a party vibe with dancing and socializing then they need to move the tasting tables to the perimeter and leave a large clearing in the center for people to dance, mingle and socialize. The organizers also need to make the hard decision of either A.) selling less tickets or B.) renting a bigger space. Personally, I vote for selling less tickets as one of the other frustrating narratives of the night was how many food and winery tables closed up early because they ran out of stuff. It was a sad irony that by the time the crowds started to wane (around 9:20pm), and you could actually maneuver around more and hit the tables you missed, was when most of those tables were done for the night. One table I regret missing was the St. Germain/Trevari sparkling cocktail table. Located right near the entrance it was always swamped by people and I was hoping to have that cocktail be my nightcap before switching to water. Pretty emblematic of the whole event. This photo of one of the restaurant tables was taken at 9:09 pm with almost an hour left to go. As I mentioned above, it would also be nice if the organizers developed and expand the Rosé Lounge concept. It would be awesome to see it made into a true lounge setting that was roped off or somehow separate from the rest of the tasting with more seating and its own food pairing tables. This would offer a fantastic opportunity to truly explore the diversity of Washington State rosé–especially if they had separate tables within the lounge dedicated to different styles of rosés like the ones that Master of Wine Jennifer Simonetti-Bryan highlights in her book Rosé Wine–Blush, Crisp, Fruity and Rich. I’ll keep an open mind for next year’s Taste Washington weekend and see if I hear about any changes to the format or venue for The New Vintage. But at this point I would say the event is certainly not worth the $80 to attend. Instead I would rather spend the extra $15 to get a general admission pass to one of the Taste Washington Grand Tasting days where you’ll have 5x as many food and wine options and a heck of a lot more room to enjoy the event. Yes, there will always be crowds at the Grand Tasting but at least that event never felt like a cattle call. Tagged Albariño, Amelia Wynn, AniChe Cellars, Argyle, Boushey Vineyard, Brooke Williamson, Cabernet Franc, Chardonnay, Cox Canyon Vineyard, Domaine Ste. 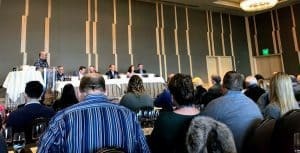 Michelle, Ducleaux Cellars, Ellensburg Canyon Winery, Fisher Pavilion, Gard Vintners, Gramercy Cellars, Grenache, Grenache blanc, Hudson House, Jennifer Simonetti-Bryan, Karma Vineyards, Lake Chelan, Master of Wine, Picpoul, Pinot grigio, Pinot Meunier, Pinot noir, Rosé Wine, Sangiovese, Schramsberg, Sparkling wine, St. Germain, Syrah, Taste Washington, Tempranillo, The New Vintage, Trevari, Viognier, WIT Cellars, Yakima Valley.